Starting work on the Hell Dorado Immortals Starter Set. It’s all about miniatures games at the Esoteric Order of Gamers lately, and work continues on getting a couple of small Hell Dorado warbands together for a game. It’s now time to move on to the Immortals Starter Set. This ancient/mythological Chinese-themed faction seems to have spent just a bit too much time in Hell, as many of their figures show signs of turning into human/demon hybrids. 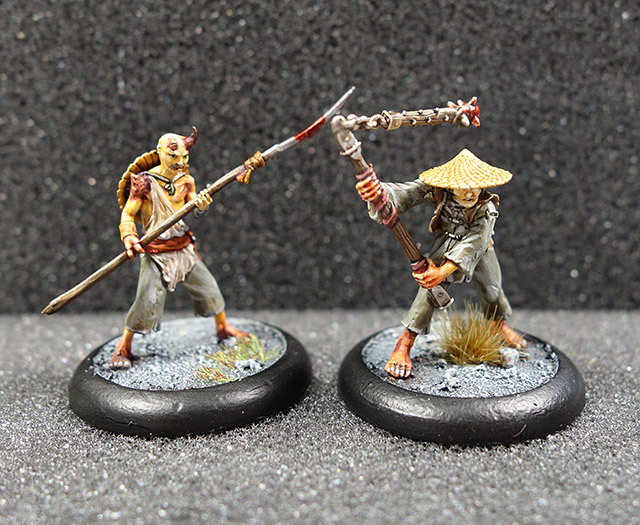 First on display are the two peasant figures that come in the starter set. 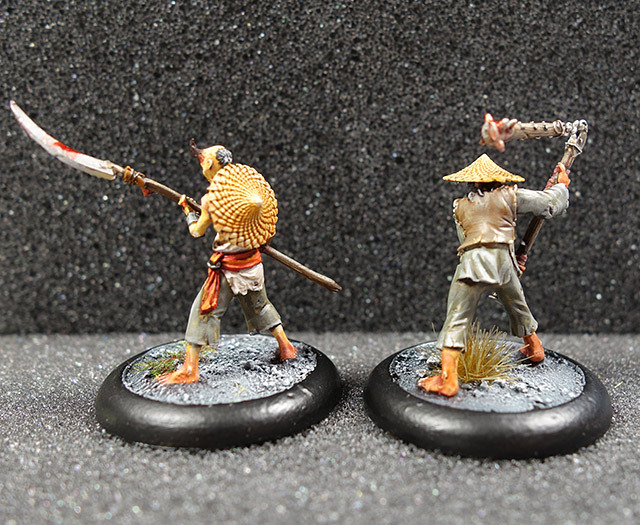 Both come with separate hats, so you can leave them off if you like for a bit of variety in your peasant groups. They’re pretty straightforward paint jobs, with a tiny bit of yellow mixed in with the flesh tones. Again, my new head loupe is responsible for a vast improvement in painting facial detail. I’ve also just realised I put the bloodstain on the leftmost figure’s weapon on the wrong edge. Oh well! It was a vicious backhanded blow, obviously. By the way, if you have any other questions about any of these paint jobs, feel free to ask in the comments below. Amazing paint job, they look fantastic. Re the head loupe, I’m now experimenting with an illuminated 2x magnifying lamp that has no less than 18 LEDs surrounding the glass. Not only does it magnify but it really ILLUMINATES the figure (as in daylight). Not quite as convenient as a headloupe perhaps, but more comfortable, especially in hot weather. My dad got one from an Australian-owned company called ‘Triumph Quality Homewares’ (pretty lame name I admit) to stop himself going blind while he was tying the rigging on a model frigate. Their website doesn’t seem to work but you can order them from HobbySew (http://www.hobbysew.com.au/accessories/lighting/triumph/led-desktop-magnifying-lamp—white.aspx). Legal Disclaimer: I am not affiliated with Triumph Quality Homewares or Hobbysew in any way. I actually tried something like this and I found it hard to use. Everytime I looked through it I had to wait for my eyesight to adjust to the magnification, and it was awkward to hold the figure under it with your head over it. I much prefer the head loupe. Everyone’s mileage will no doubt vary of course. Go one Will, you’ve bought out Hobbysew as part of your retirement fund plan, admit it! The craft industry is big money!